Restrictions have been imposed on the flying of Merlin helicopters following a crash at a Cornwall Royal Navy base. Five Royal Navy airmen escaped serious injury when an aircraft crashed at RNAS Culdrose, near Helston, after take off. One of the five is still in the Royal Cornwall Hospital, where his condition is said to be improving. The MoD said the aircraft would only carry out life-saving missions and essential operations until accident investigations have been completed. 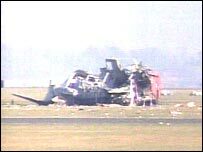 The incident happened at about 1500 BST on Tuesday, 30 March when the Merlin helicopter hit the ground near the control tower. The £30m anti-submarine aircraft, which belonged to 824 Squadron, had just taken off on a training flight. The two injured men, both pilots, were airlifted to the Royal Cornwall Hospital at Treliske. One was later released while the other underwent surgery. The other three crew were described as "walking wounded". The aircraft was severely damaged. The rotor blades came off in the crash and pieces of wreckage were strewn across the area. The main road from Helston to the Lizard, which goes along one of the base's perimeters, was closed as a precaution for an hour. The wreckage was later taken to RNAS Yeovilton, near Yeovil in Somerset, for examination. Defence analyst and former helicopter pilot Paul Beaver said the restrictions could have a significant impact on operations. He said: "There is going to be a problem with the aircraft in terms of training, because the navy because wants to do continuation training, but that can be done in a simulator to a certain extent. "The good news is that there's no perceived submarine threat to the UK, neither is there a perceived naval threat - asides perhaps counter-terrorism. "If this had been a year ago, it would have been a major problem. Merlin played a significant role in the war in Iraq and achieved considerable kudos." The 22.8 metre-long aircraft has a rotor diameter of 18.6 metres, weighs 14,600 kilograms and has an anticipated service life of 35 to 40 years. All Merlins used by all branches of the armed forces have had their flying restricted. 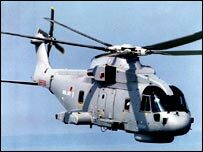 A spokeswoman for RNAS Culdrose said: "After the crash, all forces' Merlins underwent a tail rotor hub inspection. "Following the check, the restrictions were imposed and it will stay in place until the investigation by accident investigators from RNAS Yeovilton is completed."